Merit aggregate for BE aerospace ? We appreciate your interest in using pakprep.com. Your NET marks should be 145-150 in order to secure your admission in aerospace engineering. Please follow the bellow mentioned link to stat your preparation. We appreciate your interest in using Pakprep.com. As per our information minimum 60% marks are required in both metric and FSc. We appreciate your interest in using pakprep.com. Yes if you score 140-145 marks in NET there are good chances that you will secure your admission. Please follow the bellow mentioned link to stat your preparation. We appreciate your interest in using pakprep.com. Email us at “support@pakprep.com” will will register you and will provide complete guideline. I got 989 /1050 in Matric and 361/520 Part 1 in FSC…kindly tell how much marks should i get in NET to take admission in Software Engineering ??? We appreciate your interest in using pakprep.com. Your NET marks should be 140+ in order to secure your admission. Please follow the bellow mentioned links for your preparation. We appreciate your interest in using Pakprep.com. You have to score 130+ marks to secure your admission in NUST Physics department. You have to prepare your self for the NET 2 which will be in March 2018. We have 15000+ fully explained MCQ’s with answers which can help you in your preparation of Entry test. Please the below mentioned links to start your preperation. I have scored 1057 in matric , 472 in fsc part 1, and 132 in net 1. Can I get admission in software engineering? We appreciate your interest in using pakprep.com. Your academic record is good however you need to improve your NET marks up to 130 in order to secure your admission. Please follow the bellow mentioned links for your preparation. Sir! my marks in 1st part of I.C.S is 360 can i get admission in softwere engineering and how? We appreciate your interest in using Pakprep.com. You have to score 150+ marks to secure your admission in NUST Engineering programs. You have to prepare your self for the NET 2 which will be in March 2018. We have 15000+ fully explained MCQ’s with answers which can help you in your preparation of Entry test. Please the below mentioned links to start your preperation. I have scored 761 marks in fsc and 96 marks in nust will I get admission at nust? We appreciate your interest in using Pakprep.com. For major Engineering programs you have to score 135 to 140 in NET to secure your admission. However, you have to work hard to secure your admission in NUST. Please follow the below mentioned links to start your preparation. I got 80% marks in ssc and 78%(410/520) in hssc,how much marks should i get in net to get in chemical engineering or aerospace engineering? Thanks for the comment. Your marks are good but you should work very hard to score 140+ marks in NET2 to secure your admission. Pakprep.com provide all online material for the preparation of the NET. We have 15000+ fully explained MCQ’s with answer for the preparation. Start your preparation today to secure your admission. Please find the below mentioned links for more information. We appreciate your interest in using Pakprep.com. You must score above 140 marks in NET to secure your admission in NUST. You must work very hard in NET 2 to secure your admission. Pakprep provide 15000+ online MCQ’s for the preparation of NET test. Please follow the below mentioned links to start your preparation today. mechanical engineering preparation links ??? We appreciate your interest in using Pakprep.com. You should score 140+ marks in the NET2 which will be Held in march. http://www.pakprep.com provide you complete online material for the preparation of the NET2 by which many students have secured admissions in 2017. Follow the below mentioned links to start your preparation and more information. I have got 910 marks in ssc out of 1050.. and 450 in HSSC – I out of 520..
We appreciate your interest in using Pakprep.com. You have good acedamic record but you have to score 145 to 150 marks in NET2 to secure your admission. We have all preparation material which helps you in the preparation which is consist of 15000+ fully explained MCQ’s. Please follow the below mentioned links to start preparation. We appreciate your interest in using Pakprep.com. You must score above 145+ marks in NET to secure your admission in NUST. You must work very hard in NET 2 to secure your admission. Pakprep provide 15000+ online MCQ’s for the preparation of NET test. Please follow the below mentioned links to start your preparation today. We appreciate your interest in using Pakprep.com. You must score above 140 marks in NET2 to secure your admission in NUST. You must work very hard in NET 2 to secure your admission. Pakprep provide 15000+ online MCQ’s for the preparation of NET test. Please follow the below mentioned links to start your preparation today. Dear sir,I secored 919 marks in matric and 418 marks in FSc(part1) how many marks i have to secore to get admission in Mechanical or electrical engineering. Final merit depends on combination of FSC, Matric and NUST NET marks. You need to do well especially in NET. Do prepare for it using Pakprep.com the best source for NUST NET preparation. Sir I got 81% marks in matric and 78% marks in fsc part 1 can I get admission in mechanical engineering after scoring good marks in net? You have to score 140+ marks to secure your admission. Please follow the below mentioned link to start your preparation today. AOA. I got 932/1050 in MATRIC 88% and 353/510 in HSSC-1 70% How much marks do i need to get admission in NUST for BS Economics? For details details you can call us at 03355833265. Follow the below mentioned links for more details. Sir H12 wala campus ma environmental ka kya merit hai . I hv 1067/1100 in matric and 445/520 in part 1 how much marks should I secure to get admission in EE in nust? We appreciate your interest in using pakprep.com. Your aggregate must be 75-80 % for EE. Pakprep.com is best source of preparation of NET. We provide 15000+ fully explained MCQs with answers and explanations for preparation. Please follow the bellow mentioned link to calculate your aggregate. Thanks for your comment. You must score 140+ marks in NET to secure your admission. Try to work harder and score 160+ marks so you can also get some scholarship. Pakprep.com is best preparation platform for NET where you can get 15000+ fully explained MCQs for the preparation of NET as well as you can also get Mock tests which is very helpful Source of preparation. Wish you best of Luck! Sir, I have got 916 marks in Matric and 819 in FSc Pre Engg. How much score in NET do I require to get into NUST for sure if I’ve applied for Social Sciences and Business School? Specifically Public Administration and Psychology? We appreciate your interest in using pakprep.com. Your academic record is good, but NET score is bit low. Please follow the bellow mentioned link to calculate your aggregate, if your aggregate is between 70 to 80% than there are some chances for Chemical engineering. We wish you best of luck. Your marks are good wish you best Of Luck for your studies. My aggregate is 70.8 is there any chances in civil.engineering in Nust? admission in civil engineering. Try to score 150+ marks to also get some scholarship. AoA sir i got 990/1100 in matric ..472/550 in f.s.c part 1 and 125 in net can i get admission in materials engg in islamabad campus ? We appreciate your interest in using Pakprep.com. There is good chance of your admission however you should give NET3 and Try to score 150+ marks to also get some scholarship. I scored 864/1050 in Matric and 336/520 in FSc. I got 146 in NET.. Can I get admission in BBA or BS Accounting and Finance. We appreciate your interest in using Pakprep.com. There are good chances of your admission in BBA. You must give NET3 and Try to score 150+ marks to also get some scholarship. Pakprep.com is very useful source for the preparation of NET3. It contains 15000+ fully explained MCQS with answers which is very useful source for the preparation of NET. 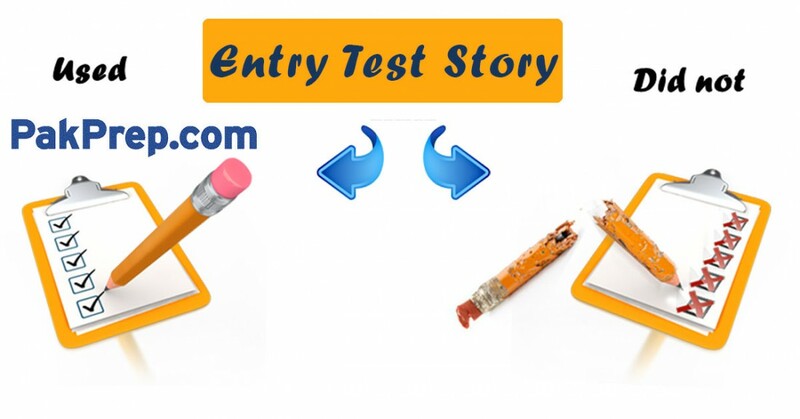 We also provide mock tests for the preparation of NET by which you can get test environment before appearing in the test. For more details please follow the below mentioned links or call our helpline 0335-5833265. Sir can you plz tell me that is there any chance for me in EME, my NET aggregate is 73.4? I will be very thankful sir. We appreciate your interest in using Pakprep.com. Try to score 150+ marks to also get some scholarship. I have got 96 marks in NET can i secure admissions in nust ? i’ve got 906/1050 marks in matric and 897/1100 in fsc. my NET score is 132. There Is good chance of your admission. Please follow the below mentioned link to calculate your aggregate. How much do I need to score in net 3 to secure admission in BS public administration. My fav score is 789/1100 and olevels 641/900. Kindly guide. We appreciate your interest in using pakprep.com. NUST NET for Engineering will consist of 200 MCQ’s from (Maths (80), Physics (60), Chemistry (30), English (20) and Intelligence (10) ). You must need 120+ marks to secure your admission. Please follow the bellow mentioned link for your preparation of your NET test. For more details you can call us at 0335-5833265. I have aggrefare of 75.22 can i get admission in civil or electrical at h-12?? Try to score 80%+ aggregate in NET3 to secure your admission as well as get some scholarship. 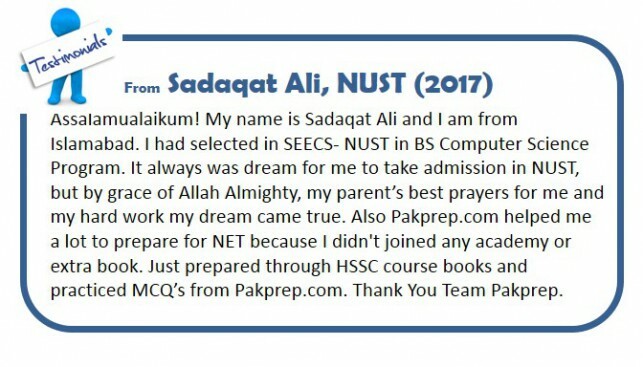 Please follow the below mentioned link to start your preparation through Pakprep.com which is Pakistan’s best source of preparation for NET. If I do ICS with statistics, then will the Nust university Islamabad take me the entry test with computer science, math, English and statistics?. The main question is that NUST added the statistics in entry test or not? Sir my marks in matric is 932 and in fsc part 1 is 418 can u plz tell how i should get maarks in net to secure my admission in machatronics engineering….??? completed in 2017 . I have one year gap will that affect my admission somehow , also how much would i need in NET ?? I have 918/1100 marks in Fsc, 963/1050 marks in matric and 125 marks in NET 1…can I get admission in CS Nust H-12 campus? I scored 990/1050 in matric, 484/520 in fsc part1 and 152 in net 2.Is there any chance for admission in mechanical in nust? I have 150 in NET, olevel equivalence is 89%, is there a chance in electrical engg from seecs? I want to get information of nust merit list of 2017 for bs chemistry. Plz can you tell. Are there any chances in PNEC mechanical engineering. 730/1100 in F.sc and 114 in NET can i secure admission in A&F ? Sir my NUST aggregate is 69.4%, in which fields there is probability to get admissions except Karachi campus? Sir I have scored 110 in NET, 1001/1050 in matric and 372/505 in 1st year.Sir any chance in BS chemistry from nust? I have got 971/1050 in matric ,454/520 in part l and 120 marks in net l . Is it possible for me to get admission in cs or se? My aggregate is 68.8%. Is there any chance i will get admission in Applied Biosciences? Sir I got 930/1050** in matric and 900/1100 in FSC. How much I have to score for BS psycology or BBA? What are minimum numbers required in engineering in Nust. My O level equivalence is 83.3% and A level equivalence is 79.9%, i scored 123 in net but couldn’t get admission in cs. i want to know how much i need to score this time to secure my admission in cs (H-13 branch). sir 70% fsc and 80% matric can i get admittion in nust for bs chemistry . How much aggregate is required for Civil Risalpur and Chemical Engg? I have 837/1050 in matric and 668/1100 in fsc…how much score do i need in NET ..for BS mathematics..? Sir I’ve secured 1064/1100 96.72% in matric and 453/520 87.12% in FSC part 1. How much numbers are requires for me in NET 1 to get admission in software engineering or computer sciences Islamabad campus? A. O. A. I secured 872/1100 in matric and 729/1100 in Fsc previous year. But now i repeat 2nd year to improve my marks. So, when i can apply for NET test? I have 89.3 % in olevel, and 3A’s in As level. And score 122 in NET 1. What NET score should I score to get in BS Physics. Salam sir i got 80% in matric nd 70% in fsc, how much should i score in net to get adm in bba or social science ? My aggregate is 71.28 in nust.what are my chances for admission?